Noted. | FineStationery.com: Last Day to Enter our Pinterest Sweepstakes! Last Day to Enter our Pinterest Sweepstakes! Today is the last day to enter our Season of Celebrations Pinterest Sweepstakes! If you haven't entered yet, what are you waiting for? 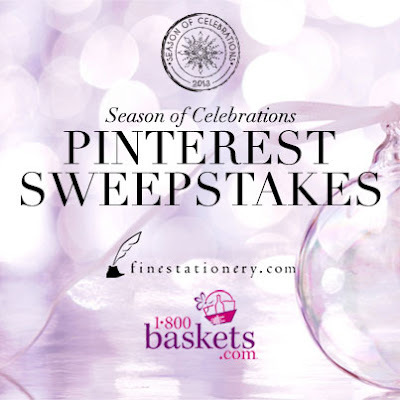 Simply fill out the information entry form on our Facebook and repin 5 of your favorite holiday inspired pins to your Pinterest page, and you could be eligible to win $200 from FineStationery.com AND a Gourmet Gift Basket (worth $49.99) from 1-800-Baskets.com! Four runner up winners will win $25 to FineStationery.com.